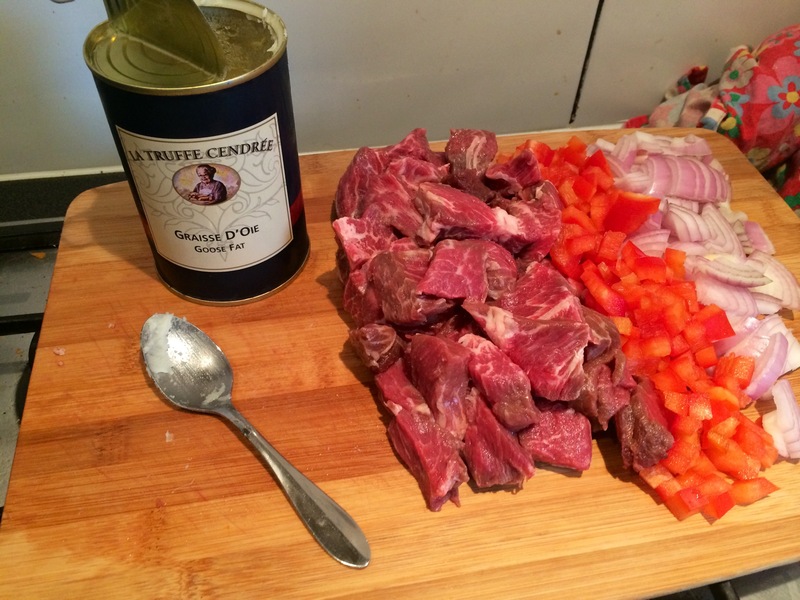 Many fine recipes for beef bourguignon .. That classic dinner party dish.. 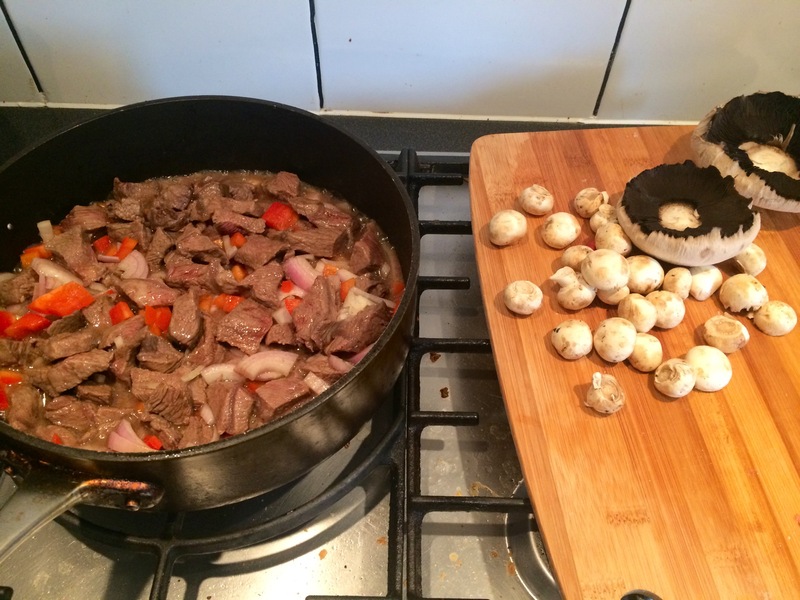 The make life easy yet everyone thinks it was complicated dinner party dish.. Marinating the meat in wine for 24 hrs..adding boiled pork rinds scraped.. Lardons, those tincy onions and button mushrooms.. Finishing with a flame if cognac . .. 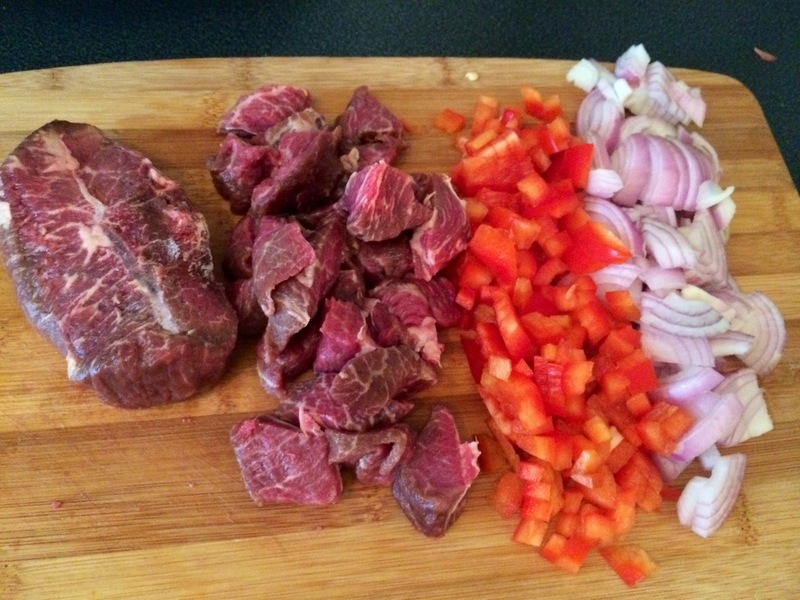 So this is Mr Fitz’s easy beef bourguignon ..
Chop roscoff onions.. Half a Turkish red lomo pepper.. (Even though it’s actually grown in Spain .. Go figure??).. Red ticket feather steak.. Perfect for this dish.. Although for even quicker speed sons nice blade steak would work too.. Yet that was not on red ticket. All chopped..
And fried off in goose fat.. Of course.. 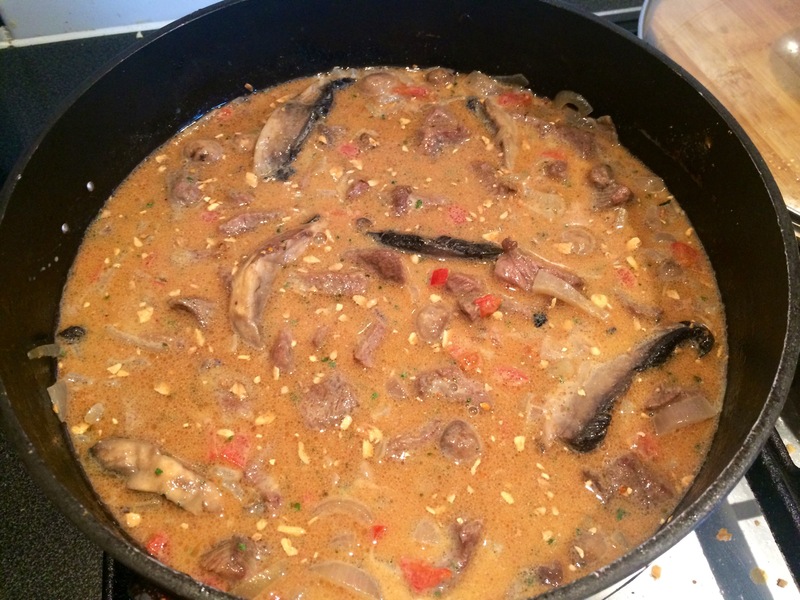 The juices from the onions, pepper and feather steak start making a wonderful sauce .. At this stage and the mushrooms.. Field and button as that was what was in the fridge..
Let that come together and .. Ready for this??? Add the contents of a packet of seasonings from the Coleman family.. (Sometimes it has to happen. ).. Pop that all into the slow cooked on low.. Then warm .. Whilst making the spuds.. 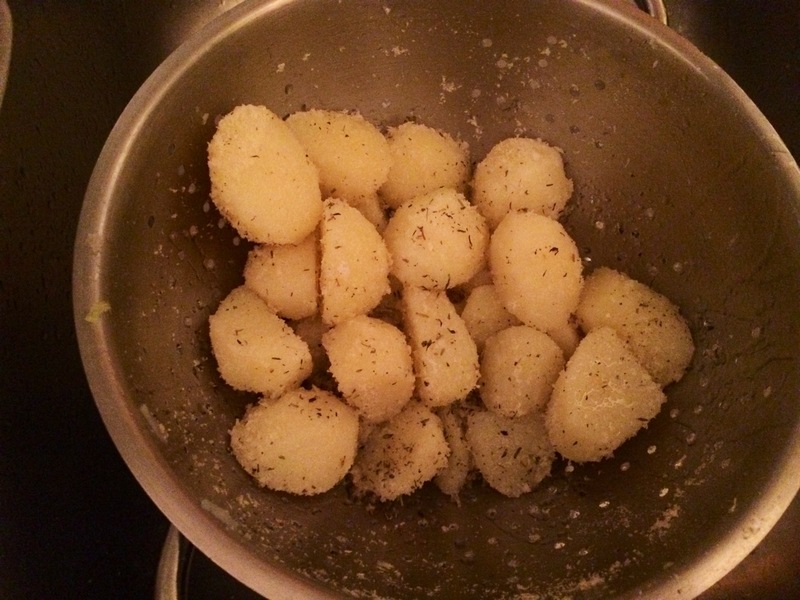 Par boil dirty potatoes.. Then into the colander .. Sunflower oil ( as am all out of mrs Middletons ..).. Sprinkled atop then the Japanese panko crumbs.. And done Japanese seasoning.. 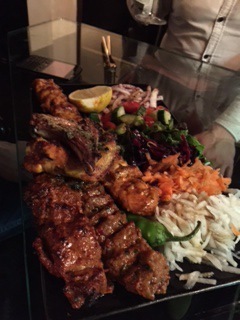 Into the tray.. Into the oven.. 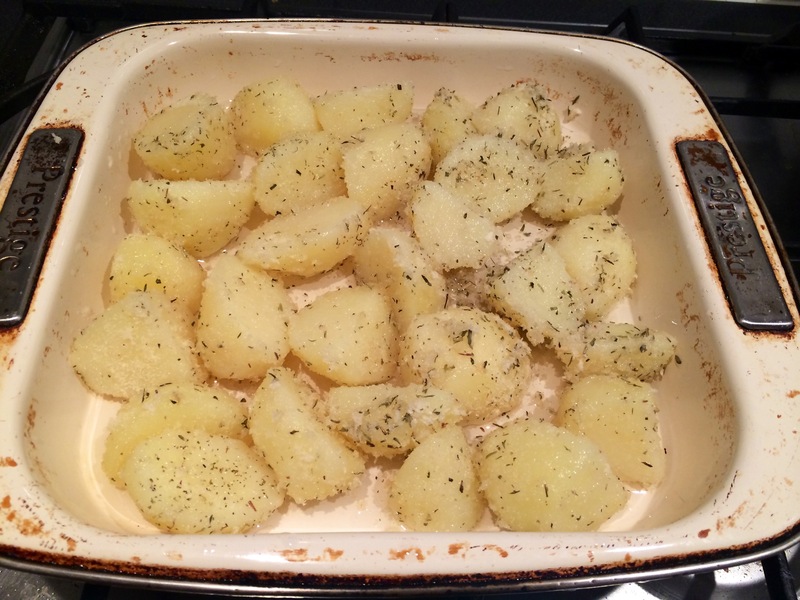 They take a while as these are not really the ideal roasting spud.. Yet that’s cool just let them do their thing.. They are ready when they look like this.. 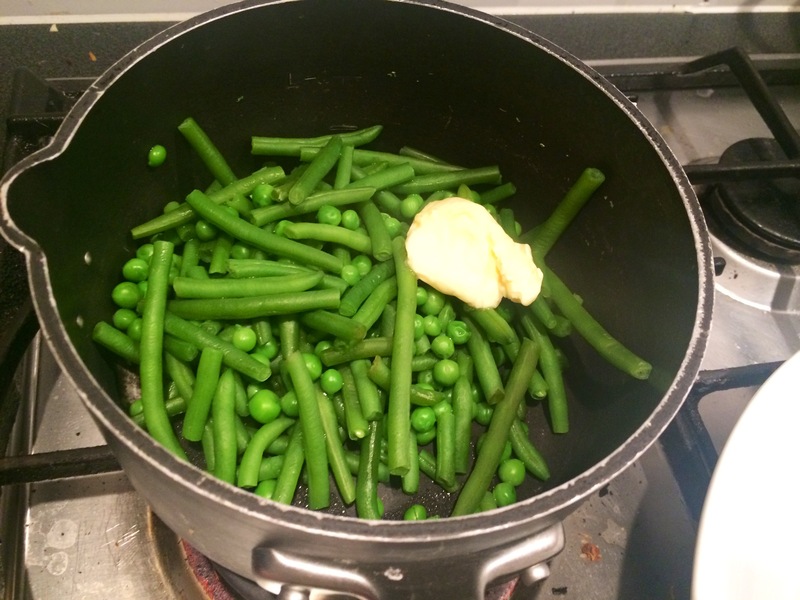 Boil up some French beans and peas with some unsalted French butter ..
And pop it all onto a plate.. 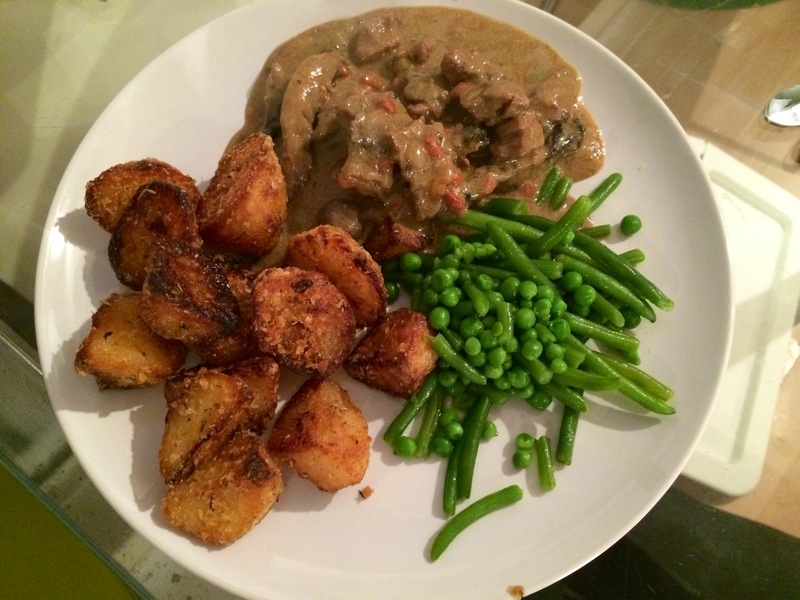 Beef bourguignon ala Mr Fitz..
My attorney went out with his wife and some pals last night to a very nice kebab house.. It’s sheesh in chigwell .. Google it.. It’s pretty good looking.. And so was this mixed grill pic he sent ..
Maybe he will take me sometime!! 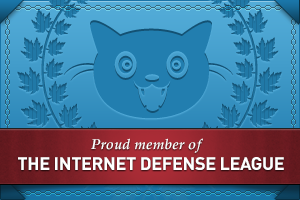 ‹ A guest post? Kinda! Delicious looking meal, Mr. Fritz. 🙂 Have a pleasant week ahead. Oh my gosh I wish that meal was in front of me. Those potatoes are gorgeous gorgeous gorgeous! I think I might have had this meal at a pub in Gatewick. Of course not like you would have made it for me. I’m kinda in love with those potatoes. Happy Fiesta Friday. And happy fiesta friday to you too! 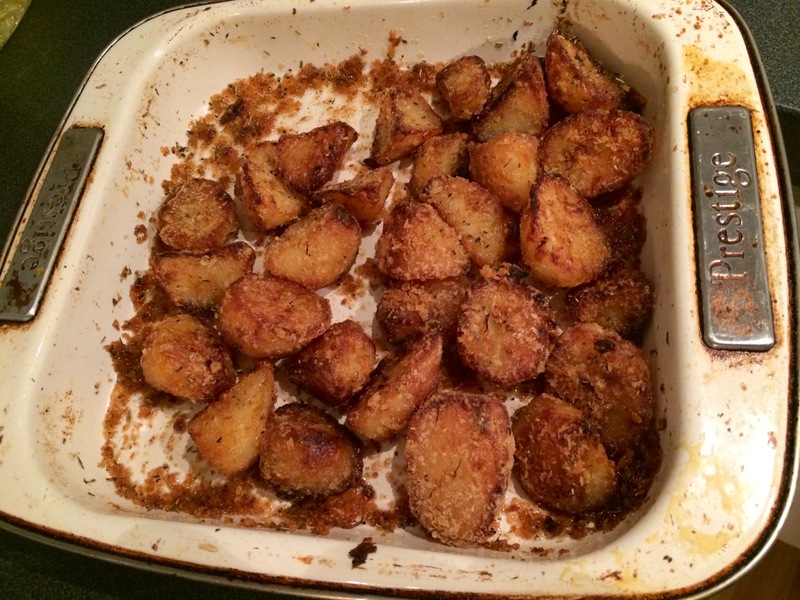 You are the potato king, those potatoes look so crispy and salty and peppery! Fabulous. Yeah, except I’m running into all kinds of regulatory “issues” . . . considering whether at age 47 I want to actually start a business . . . . and haul my goods to a commercial kitchen and so forth, or just sell “black market.” In the meantime, you are still an inspiration! go for it! not in a commercial kitchen though.. you would lose the authenticness..! go blackmarket your counyry was built on free enterprise no? or even.. why not set up a ‘pie-club’.. people pay a subscription.. monthly.. weekly, fortnightly.. one-off. whatever.. then you make a pie for them.. you could have a place to pick them up.. male it a mystery type thing…be very good that! thank you I needed some guidance, the rules and regulations for selling goods with a meat or cream filling require that you work out of a commercial kitchen, which means renting space and hauling ingredients and equipment and you have a set time to be in and out. It’s kind of a bummer. Many chefs who don’t want to deal with a brick and mortar are doing supper clubs underground these days and even “pop ups” in other chef’s restaurants . . . I think the pie club is awesome!!! Can you make them in a resteraunt kitchen? Maybe during the day? Or at night? Least then you would tick those boxes? I am thinking of doing the same with my sausages.. Making them in my butchers.. I dont want the food police on me either!! Hmm how about a pie club where you eat.. Make it really celebratory? Pipe in the pie? Make it ceremoniuis? Then people can buy pie to go home with? Wow what a wonderful meal! !